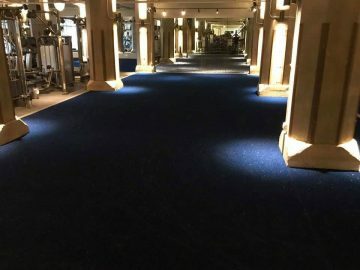 Synthetic Turf International of Chicago recently installed a beautiful navy blue synthetic turf at the River North Gym. 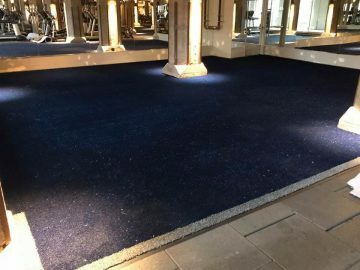 STI Chicago used custom color navy fibers with black thatch in our Trainers Choice product. 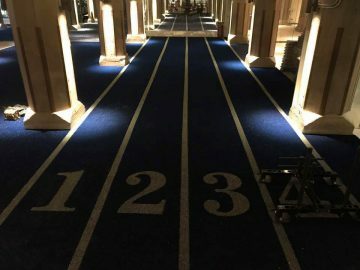 The install also included inlaid lines and numbers on the track area as well as an inlaid line around the perimeter of the whole install. River North Gym is downtown Chicago’s finest fitness center, offering cutting-edge group fitness classes and individualized and small group personal training. Synthetic Turf International not only has premier turf products but also a state of the art AquaFab machine and department that can water cut just about any logo or design into your turf. Trainer’s Choice features a 50/50 blend of nylon and polyethylene yarns, offering all the advantages of previous generations of indoor training turf, and performs even higher in wear and resistance tests. These systems can also be portable with added 4” or 8” Velcro. As always you can visit our application page for more information, browse our gallery for ideas and contact Synthetic Turf International to Experience A Greener World.